: This breed goes back to medium-sized dogs that existed in Japan in ancient times. 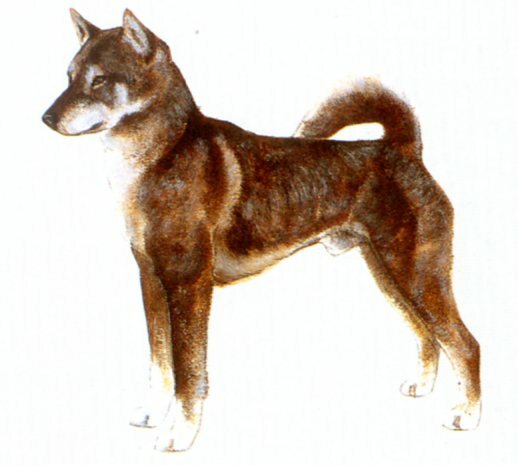 The Shikoku was bred as a hunting dog, mainly for hunting boar in the mountainous districts of Kochi Prefecture. It is sometimes called « Kochi-ken » (ken = dog). There were three varieties of this breed-Awa, Hongawa and Hata-all named after the area where they were bred. Among them, the Hongawa maintained the highest degree of purity, because the breeding area was not easily accessible from anywhere. These dogs are tough and sufficiently agile to run through a montainous region. They are characterized by their sesame coloured coats. The breed took on the name of the region and was designated as a « natural monument » in 1937.
: A medium-sized dog with well balanced and well developed clean cut muscles. It has pricked ears and a curled or sickle tail. Conformation strong, well-boned and compact. : The ratio of height at withers to length of body is 10 11.
: A dog of marked endurance, keen in sense with a naive feeling, energetic and highly alert; an enthusiastic hunter; docile towards his master. : Rather long, wedge-shaped. Nasal bridge straight. : Teeth strong, with a scissor bite. : Relatively small, triangular, set well apart, dark brown in colour. : Small, triangular, slightly inclining forward and firmly pricked. : Deep, ribs well sprung. : Set on high, thick and carried over the back vigorously curled or curved like a sickle. The tip nearly reaches the hocks when let down. : Moderately sloping with developed muscles. : Set close to the body. : Straight and clean cut. : Tightly closed with well arched toes. Pads hard and elastic. Nails hard and black or dark in colour. : Powerful, with muscles well developed. : Moderately angulated and very tough. : Resilient, with rather narrow strides, but light. Action is quick and turning is possible. : Outer coat rather harsh and straight, undercoat soft and dense. The hair on the tail is rather long. Sesame, black sesame and red sesame. Sesame: Equal mixture of white and black hairs. Black sesame: More black than white hairs. Red sesame: Ground colour of hair red, mixture with black hairs.